Kendall is the little girl who goes to the park with her grandmother every weekday between ten o' clock and eleven-fifteen. 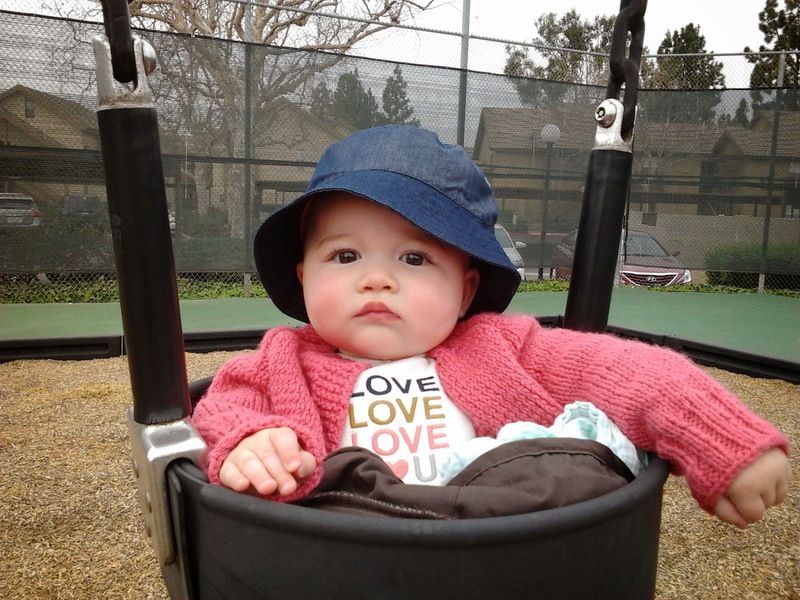 She is eight months old and likes to swing, too. She looks like a runt next to me, so Mom and I just assumed she was underfed. Turns out that is not the case, however, because Kendall's grandmother (who lives in a bedroom next to hers in her parents' house) has an iPhone app that tracks every second of Kendall's life. It keeps track of when she eats and how many ounces, when she sleeps and for how long, when she poops and how much, and is currently filling out her college applications and setting up a Match.com account on her behalf. Kendall's grandmother told mom that the other day, Kendall fell asleep in her stroller on their walk home from the park (which was right on schedule, according to the iPhone). But Kendall woke up when they got home, after sleeping only twenty minutes! Gasp! "I said, 'Oh no you don't,'" the grandmother told us. "'You sleep for an hour. That's how we do things around here.' So I took her upstairs and laid her in her crib." "And that worked?!?" my mom replied incredulously. "Oh yeah. They've got this baby on a schedule. You've gotta have a schedule. Don't you have one?" "I want one," Mom said wistfully. I narrowed my eyes. This lady was trespassing. "But I am sort of finding myself a prisoner to Little A's random whims," Mom explained. The grandmother clicked her tongue and shook her head in a way that suggested my mom had just told her she fed me beer before bedtime. "You need this app," she said, and proceeded to show my mom the program on her phone. Kendall swung back and forth listlessly in her swing. If I had the hand eye coordination to throw something at a target and hit it, this would have been the perfect opportunity. "I read her three books before she goes to sleep. The same three books every time. And by the time Kendall sees the little girl in the third book, she smiles up at me and then starts falling asleep on my lap." "Are you serious?!?" my mom asked, flabbergasted. I am sure she was thinking of when she tried to read me a book that morning, and we reached an impasse when she couldn't turn the page because I was eating it. "Babies are smart," the grandmother said. "She picked up on her routine in days." Kendall gnawed on a link of the chain holding up her swing. The conversation ended with merciful abruptness when the iPhone jingled. It was the app telling the grandmother it was time to feed her. She picked up Kendall, dug a glass bottle of breast milk out of a little cooler under the stroller, and walked over to a park bench. Mom watched them for a moment and then looked at me. "We need one of those." I think she meant the schedule, but I have my eye on that glass bottle. Kendall better not turn her back.